It is said that whoever hears the sound of the trumpet and does not take warning, if the sword comes and takes him away, his blood shall be on his own head. These words are from the Ancient Texts so they must be true. The King of Ameron is a tale closer to truth than fiction of a land that has been given that warning. What happens to those who take heed...and to those who do not? 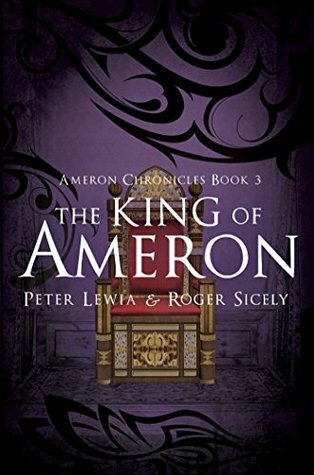 This continuation of the Ameron Chronicles sheds light on a land torn asunder by an evil within, that is no less dangerous than the evil lurking in the shadows. Brothers by birth, bound by the fire of circumstances, Thomas and Hank strive to save a reeling nation. But, to do so, they must accomplish the impossible! Book three is where this series really grabs a hold of you and refuses to let go. Suddenly there are even more questions than there were before and you just keep reading hoping for some answers! The cast of characters continues to grow in size but somehow the authors write them in such a way that for the most part, there's no difficulty in keeping everyone sorted out. For those that get a bit confused, there's a cast of characters listing in the back of the book. I'm unsure as to why it's written the way that it is, but I'm sure that will come to light before the end of the series. Hank and Thomas are doing what they can not only to survive but to bring along the kingdom with them. Each of them has their own roles and as each book progresses, we're dragged along (in the best of ways) on their emotional journeys as well as their physical ones. I honestly cannot wait to see what happens next. I have a million questions... Is Youngblood a good guy or a bad guy? Who is this mysterious assassin? What's happened to Thierry? What about the infant? Will the bad, icky creatures overrun the capital? I guess I'll just have to keep reading to find out. If you'd like to read along with me, contact the authors via their Facebook page and convince them to sell you copies of this series!